I recommend GMRS radios as a backbone community communications system. 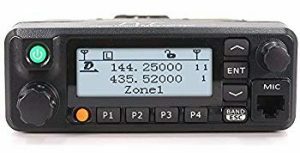 I published a recommendation for handheld radios back in April this year… see http://www.bitterrootbugle.com/2018/04/08/handheld-radio-recommendation/. I will not repeat all of that detail or links here. I have not changed my suggestion, but am documenting more hardware in this post to make for a complete home and mobile set for the family. 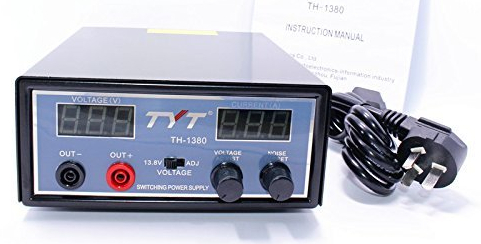 Your first move into GMRS radio is, according to me, getting a TYT MD-390 for $160. Everything built in. One tidy package. One modest price. For $25 and up you can get various BAOFENG models that can do two-way GMRS communications. Those are quite different in operation and have a learning curve that frustrates many new owners into non-use. IF you choose this route, make sure somebody who loves figuring out new technology is part of your group. I HAD several BAOFENGs, but needed to focus my old brain on other things. IF you have someone adept, you can have a number of cheap radios for the price of one MD-390. Warning: they are not as nice in many ways. IMPORTANT NOTE: Make sure you order radios in the 400-480MHz UHF (ultra-high-frequency) model for GMRS use. The UHF GMRS set of frequencies was established by the FCC specifically for non-ham, non-commercial group use with a $70 license covering the whole family / household use for ten years. Other significant features of the latest MD-390 include digital mode (greatly enhancing transmission clarity and reach), VOX (voice actuated, hands-free transmission), a good speaker, GPS, straightforward controls, waterproof, dustproof, and a great display. Programming can theoretically be accomplished through the display, but using a computer is the only real way to do it. This is like most technology in that the learning curve can frustrate new users. Find someone who loves to learn these things and tag along for the ride. 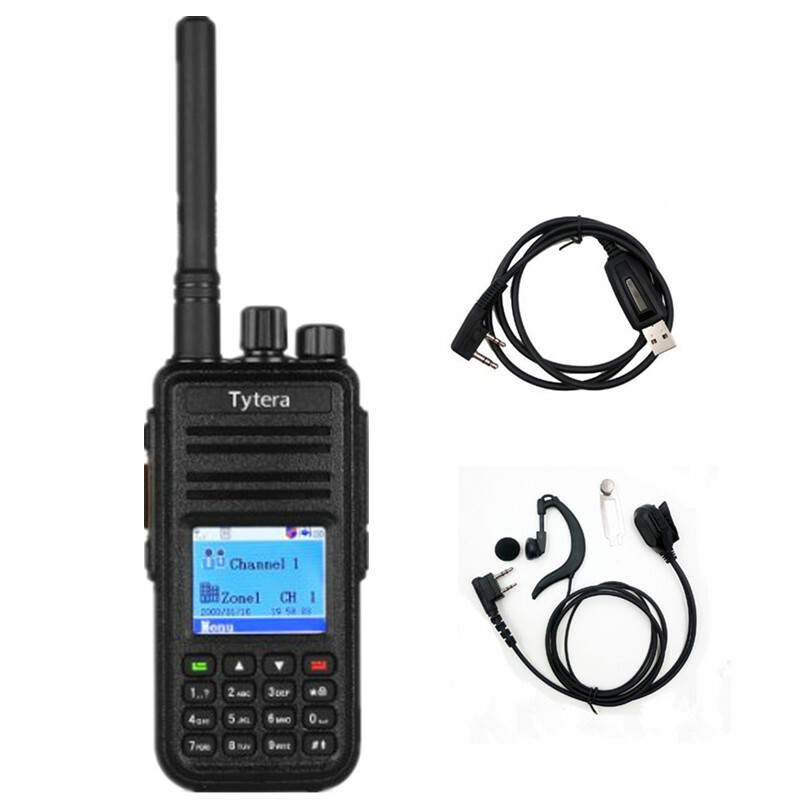 A great companion to the above is the TYT MD-9600 mobile / base unit. While you wouldn’t want this kind of RF (radio frequency wave) power near your body, using a remote antenna with a mobile unit lets you jump from 5 watts transmitting power to 50. Couple that with a much larger, more efficient antenna and you dramatically extend the range of your two-way communications. This one also gets excellent reviews from the amateur radio community as well as less experienced users. Particularly exciting to me is that the programming and user interface is compatible, making operation of the two relatively easy to learn. 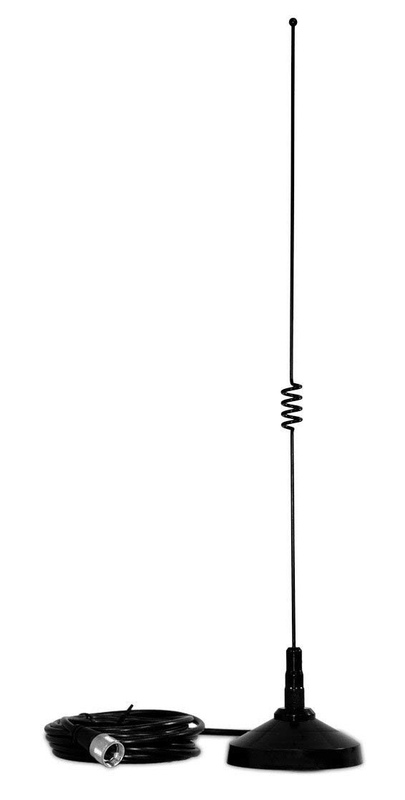 The mobile units, whether installed in a vehicle or in a home are built for connection to an external antenna. Professional radio installers disdain magnetic-mount antennas as significantly inferior to those drilled into the car’s bodywork and better grounded. But for getting started, a mag-mount attached to a large metal surface will show great gain over your handheld’s performance. 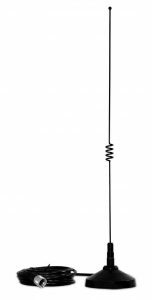 For compatibility with the MD-9600 you will want an antenna that handles both the UHF and VHF bands. The one to the left from Amazon for $24 will fill the bill nicely as long as you can find steel within 12 feet of the radio. Plan ahead and get one with a longer cable if 12 feet won’t do. Be sure it transmits 2 meter VHF & 70cm UHF (144-148Mhz & 430-450Mhz) and has a PL-259 connector (rather standard) for connection to your radio. The mobile radios require 12-volt power, which is the widespread automotive standard. In your vehicle it will install much like a car stereo with the exception of antenna requirement. NO, your automobile AM/FM radio antenna will not work at all. I have a friend in Hamilton who runs Disguised Antennas .com if you really want to get serious. For your home or base station you will need a clean 12-volt power supply with enough power to run a two-way radio. Tyterra makes one that Amazon sells for $140. I have no experience with these as I chose to go the other route. 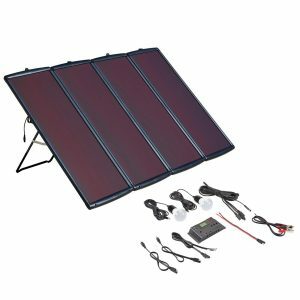 Solar 12-volt power supplies have the advantage of being grid-independent. I ask myself, “When will I want my radios the most?” The obvious answer is, “When the power is down and I want to know why? – What is happening?” I chose to spend a bit more to have the answers when my lights go off. While I went with a mix of used and new parts, this package from Harbor Freight is probably a good start. Though better quality should be considered, I know of several of these that are working just fine. The bad news is you will have to add at least one $70 battery to their $200 charger, which is why people start with the power supply listed above. Worse, you will need to figure out mounting the panel, wiring and connectors to get that juice in a fused connection to the radio. The good news is you can do a bunch of other things with 12-volt grid-independent power … run lots of LED lights, other radios, chargers for your electronics, etcetera. Plus 100 watts could charge several automotive or marine 12-volt batteries linked together for some really good storage capacity. Do not connect more than one unless you know series from parallel. Done incorrectly, you could fry anything you connect to it. Another grid-down choice would be to simply get a 12-volt automotive battery connected to a standard battery-maintainer trickle charger. You would at least have some grid-down capability, clean 12-volt power and a simple system. At $604 for the basic 2-radio setup, I spent a bunch. However, you can spend A LOT MORE on a single cell phone that will not work in an emergency. Two-way radio is a communications technology that keeps on ticking when the grid goes down or disaster overloads the the phone circuits. It also does a much better job of reaching out to anyone within range, not just the phone number you have coded into your cell. In the recommendation above you get two radios for the price of one cell phone.